In this video, we are going to look at how to simplify numbers raised to positive exponents. This is a quick lesson on positive exponents. This means that we’re going to multiply the base by itself by the number of the exponent. Our final answer is . is not the same as . What if we have ? This means we’re going to multiply times. If we have this is multiplied times. So we have to multiply the base by itself. The number of times you do it is what the exponent stands for. If you see a term or variable raised to an exponent such as . This only means that we have multiplied by itself times. 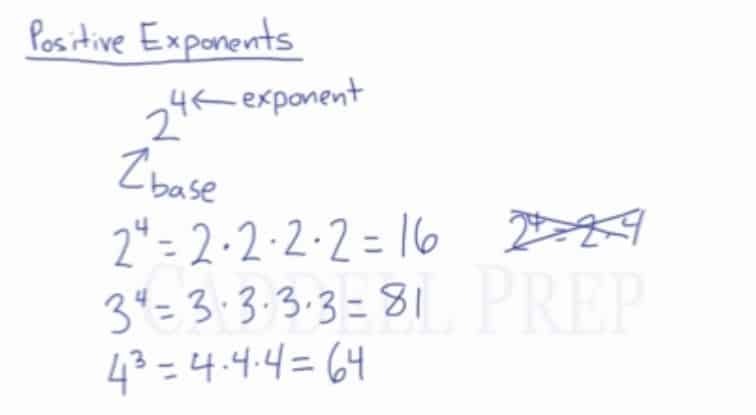 Just to review, we have the base and the small number at the top is the exponent.